We created our DIY Inflation Tube Strap so people who own inflatables don't have to pack up their inflatable and take it to a repair facility just to get an inflation tube strap sewed on. Doing that is way too much work now that you can purchase one of our DIY Inflation Tube Straps. If your commercial inflatable slide or jumper needs an inflation tube strap replaced or repaired, you can do-it-yourself with our DIY replacement strap kit. 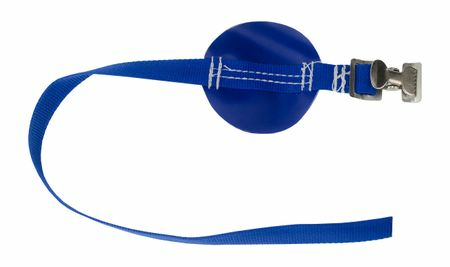 Simple to install, this strap will last years on your bouncer. You can install this inflation tube strap in about a minute. Don't lose a rental because your blower comes off your inflatable bouncer during an event. Make sure your inflation tube straps are secure. Replace your old inflation tube straps with this DIY do it yourself replacement strap for any inflation tube. Comes with 1" webbing and alligator clip to keep unit secure during use.